Gérard Fromanger has played an important role in the history of Narrative Figuration. 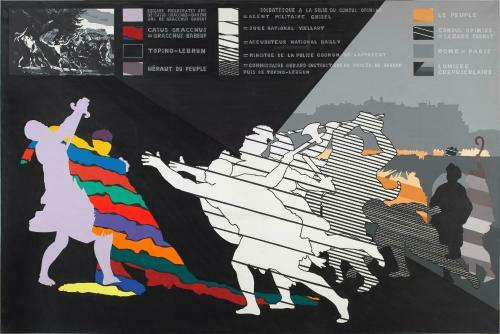 This movement arose in France at the end of the Sixties, in a climate of international tension. Until 1972, it included painters with varying techniques, all driven by a desire to break with the then dominant Abstraction and reinvent painting, using images of masses to restore a political dimension to their work. These two pictures, forming a diptych, belong to the series of five works entitled Hommage à Topino-Lebrun, in reference to the revolutionary painter guillotined by Bonaparte in 1801. La Vie et la mort du Peuple reproduces in grisaille the image of a Paris street, taken from a photo. Meanwhile, La Mort de Caius Gracchus echoes the composition and title of the famous painting by François Topino-Lebrun, and pays tribute to the Roman “tribune of the people”, who died in a riot.